This topic contains 59 replies, has 12 voices, and was last updated by Lance 3 months ago. STWALT, like all urb’s games, has a lot of randomness and luck inherently built into it and perhaps ore so than the other games because every action is actually dice-based. It’s the equivalent of playing any game in a casino, except the game isn’t necessarily working to make sure you lose. If you feel like you can’t beat it (I’m not so ‘great’ at it myself, lol) then just keep playing it. The more you play it, the higher your chances of getting a game that you win. In terms of tips, just do everything you can to improve your roll chances and you’re likely to get the job done. @lance Eveytime I see the new buxom princess, it reminds me how much more I liked the previous princess sprite, who still exists as the princess inventory icon. She seems more princess like, though other princess has plenty going for her, haha. As for your halfling hero, you certainly loaded him for bear. I hope the adventure was successful. Games was good as seen. Forgot if I won but that does not matter much in STWALT for me. Kind of true with the “new” princess although she looks more like part of the artwork while the small icon (old) one has an anime touch. On a spontaneous thought about a fantasy game princess this hooty popped into my head. The game was a blast. Dying there was just as part of the fun as winning. reminds me a lot of urbzz games. And since this place can always use some input. That thief’s heavy pockets and armor might give him pretty good defense, but nothing could ever beat the obscene stats of a lvl 8 viking, I don’t think. That monster class is a force to be reckoned with. You wouldn’t happen to have any vids of that man, would you? Sorry no vid but a nice pic of one. Guess I could make a few STWALT vids now and then ee? Made a vid of a Viking vs Diterliz. If you care to look at the log in the end you will see that I scammed a bit with making money but only because I could not find the Temple-of-Elemental-Evil before time ran out. In the log are also many other little surprises. Diterliz might have done well against a regular viking, but there was no way in hell he was ever going to take down a drunk viking! A job well done, Lance, though could a village next to the temple of Elemental Evil really be that peaceful? Maybe Diterliz is a gracious bar patron that tips well. As a side note, that exploration trip must’ve been to the fertile lands of Last Winter. How else could you achieve such returns, when the Grim Reaper’s scythe will only net you a little over 100 big ones. I guess the real question is where did all that gold go? You could’ve crushed him to death with it. -Finds a shop 10 feet away from the volcano that sells “The One Ring” for 100 gold. -Questions himself if this is the quest item he is looking for. -Ignores “The One Ring”, thinking the ring required would be obtained by special series of quests. The One Ring for 100 gold? Even if you went to the merchant Guild they would cost 150 gold it they miraculously would have it (them) there. Not possible or is it? Noice crit chance multipliers. Smeething le Gold Exotic Armor be a most honorable feat. Almost as hard to do as re-forging Excalibur and just as rare to see getting posted here. – Day 107, Riderx, Too late! The realm is doomed! at level 6 after 106.9 days of travel. Riderx had 1865 gold pieces in his purse and managed to gain 50 experience points. – Day 106, You rolled a 38 (17+21), which beats the attack score (28) of the Large Red Dragon. The creature is defeated!! You gain 5 experience points!! – Day 106, You rolled a 31 (10+21), which beats the attack score (28) of the Large Red Dragon. The creature is still alive!! – Day 106, You hit the Large Red Dragon (7+21) but it resisted the damage!! – Day 106, You rolled a 29 (8+21), which beats the attack score (28) of the Large Red Dragon. The creature is still alive!! – Day 106, FUMBLE!! (You rolled a 1 on the d20). You manage to land pretty hard on the ground while attempting one of your special signature moves hard enough to destroy an item in your inventory. – Day 106, You hit the Large Red Dragon (16+21) but it resisted the damage!! – Day 106, You missed by rolling 27(6+21), which is lower than the attack score (28) of the Large Red Dragon. You also missed your saving throw (17) which is over your defense score of13!! You lose 1 hit point. – Day 106, You rolled a critical (18), delivering a crushing blow to the Large Red Dragon but the creature is still alive!! – Day 106, You hit the Large Red Dragon (11+21) but it resisted the damage!! – Day 106, You rolled a 28 (7+21), which beats the attack score (28) of the Large Red Dragon. The creature is still alive!! – Day 106, You rolled a 33 (12+21), which beats the attack score (28) of the Large Red Dragon. The creature is still alive!! – Day 106, Critical hit!! (16), but the Large Red Dragon is still standing!! You have no choice to deal with it hand to hand now!! – Day 106, You ready your weapons and wave at this flying mass of anger and destruction. – Day 105, Target hit!! 21 (15+6) You shot that Skeleton dead!! You gain 1 experience points. – Day 104, The merchant guild is importing a lot of goods. Expect higher prices. – Day 102, You sold your Book for 75 gold pieces. – Day 102, You sold your Gothic Plate Armor for 100 gold pieces. – Day 101, You rolled a 26 (5+21), which beats the attack score (13) of the Orc. The creature is defeated!! You gain 1 experience points!! – Day 101, Target missed!! 12 (6+6), You have no choice to deal with it hand to hand now!! – Day 97, You rolled a 34 (14+20), which beats the attack score (28) of the Large Red Dragon. The creature is defeated!! You gain 5 experience points!! – Day 97, The breath weapon destroyed your shield!! – Day 97, You rolled a 34 (14+20), which beats the attack score (28) of the Large Red Dragon. The creature is still alive!! – Day 97, You’ve been burned alive by the dragon breath. – Day 97, You are now terrorized by a display of so much power and anger. – Day 97, You hit the Large Red Dragon (8+20) but it resisted the damage!! – Day 97, You missed by rolling 26(6+20), which is lower than the attack score (28) of the Large Red Dragon. But luckily, you blocked the counter attack by a saving throw (10) under your defense score of 16!! – Day 97, You rolled a 28 (8+20), which beats the attack score (28) of the Large Red Dragon. The creature is still alive!! – Day 97, You rolled a 33 (13+20), which beats the attack score (28) of the Large Red Dragon. The creature is still alive!! – Day 97, You rolled a 31 (11+20), which beats the attack score (28) of the Large Red Dragon. The creature is still alive!! – Day 97, You rolled a critical (20), delivering a crushing blow to the Large Red Dragon but the creature is still alive!! – Day 97, You hit the Large Red Dragon (17+20) but it resisted the damage!! – Day 97, You rolled a 30 (10+20), which beats the attack score (28) of the Large Red Dragon. The creature is still alive!! – Day 97, You missed by rolling 23(3+20), which is lower than the attack score (28) of the Large Red Dragon. But luckily, you blocked the counter attack by a saving throw (5) under your defense score of 16!! – Day 97, You rolled a 32 (12+20), which beats the attack score (28) of the Large Red Dragon. The creature is still alive!! – Day 97, Target missed!! 10 (5+5), You have no choice to deal with it hand to hand now!! – Day 97, You ready your weapons and wave at this flying mass of anger and destruction. – Day 97, You rolled a critical (17) with that bow landing an arrow straight between the eyes of the Ghoul!! You gain 1 experience points. – Day 93, You sold your Mithril for 125 gold pieces. – Day 93, You sold your Heavy Sword for 100 gold pieces. – Day 93, You sold your Chest Key for 13 gold pieces. – Day 93, You sold your Scroll of Create Food for 75 gold pieces. – Day 92, The King aided by the guidance of his Gygax Priests has declared magic illegal and commenced an inquisition. All magic users are now criminals and scrolls will be confiscated by patrols. – Day 92, You rolled a critical (19) with that bow landing an arrow straight between the eyes of the Drow!! You gain 1 experience points. – Day 90, You enter the workshop. – Day 89, You rolled 19 (14+5)! You successfully crafted a Mithril Armor! Look at you now high roller!! – Day 89, You enter the workshop. – Day 87, You lost 1 hp due to heat and general piss poor conditions. – Day 87, The merchant guild is importing a lot of goods. Expect higher prices. – Day 86, You rolled a 22 (4+18), which beats the attack score (18) of the Basilisk. The creature is defeated!! You gain 1 experience points!! – Day 86, Target missed!! 9 (4+5), You have no choice to deal with it hand to hand now!! – Day 84, The King has appointed a new Magistrate and declared a realm wide amnesty to those who come to the castle in 3 days and confess their crimes. – Day 84, You rolled a 33 (15+18), which beats the attack score (21) of the Beholder. The creature is defeated!! You gain 2 experience points!! – Day 84, FUMBLE!! (You rolled a 1 on the d20). You clumsily fell on the ground giving your opponent the tactical upper hand (+3 attack bonus to the enemy)!! – Day 84, You rolled a 35 (17+18), which beats the attack score (21) of the Beholder. The creature is still alive!! – Day 84, Target hit!! 17 (12+5), but the Beholder is still standing!! You have no choice to deal with it hand to hand now!! – Day 81, You enter the dwarven fortress. – Day 79, You rolled a 32 (14+18), which beats the attack score (25) of the Lich. The creature is defeated!! You gain 3 experience points!! – Day 79, You rolled a 33 (15+18), which beats the attack score (25) of the Lich. The creature is still alive!! – Day 79, You rolled a 28 (10+18), which beats the attack score (25) of the Lich. The creature is still alive!! – Day 79, Target missed!! 8 (3+5), You have no choice to deal with it hand to hand now!! – Day 78, Monsters are pouring into the realm unchecked and unchallenged. Expect more encounters. – Day 78, You rolled a critical (20), slicing that Orc Warband in half. The creature is defeated!! You gain 1 experience points!! – Day 78, You rolled a 34 (17+17), which beats the attack score (13) of the Orc Warband. The creature is still alive!! – Day 78, You rolled a 24 (7+17), which beats the attack score (13) of the Orc Warband. The creature is still alive!! – Day 78, FUMBLE!! (You rolled a 1 on the d20). You clumsily fell on the ground giving your opponent the tactical upper hand (+3 attack bonus to the enemy)!! – Day 74, You are not afraid anymore!! – Day 73, You rolled a critical (20), slicing that Beholder in half. The creature is defeated!! You gain 2 experience points!! – Day 73, You rolled a 32 (15+17), which beats the attack score (21) of the Beholder. The creature is still alive!! – Day 73, Target missed!! 8 (4+4), You have no choice to deal with it hand to hand now!! – Day 71, It appears that blind cave exploring was a very scary experience!! You run away from the cave screaming like a school girl. It’ll take you few day to shake this one off. – Day 71, You approach the caves. – Day 69, The King has appointed a new Magistrate and declared a realm wide amnesty to those who come to the castle in 7 days and confess their crimes. – Day 68, You sold your Elven Bow for 79 gold pieces. – Day 68, You sold your Flail for 34 gold pieces. – Day 68, You sold your Utensils for 11 gold pieces. – Day 68, You sold your Tent for 23 gold pieces. – Day 68, You sold your Scroll of Create Undead for 68 gold pieces. – Day 68, You sold your Traveler Boots for 23 gold pieces. – Day 68, You walk across the sturdy gates of the castle. – Day 65, You are thrown out of jail after 3 days. – Day 65, You rolled a critical (19) with that bow landing an arrow straight between the eyes of the Bugbear!! You gain 1 experience points. – Day 64, You rolled a 23 (7+16), which beats the attack score (14) of the Bugbear. The creature is defeated!! You gain 1 experience points!! – Day 64, FUMBLE!! (You rolled a 1 on the d20). You managed to hit yourself with your weapon!! – Day 64, Target missed!! 9 (5+4), You have no choice to deal with it hand to hand now!! – Day 64, The moon is dying in the night sky, slowly taking the magic substance of the realm with her. Arcane users now have a malus of -3 for casting spells. – Day 64, You rolled a 26 (10+16), which beats the attack score (21) of the Vampire. The creature is defeated!! You gain 2 experience points!! – Day 64, You rolled a 22 (6+16), which beats the attack score (21) of the Vampire. The creature is still alive!! – Day 64, You missed by rolling 20(4+16), which is lower than the attack score (21) of the Vampire. But luckily, you blocked the counter attack by a saving throw (10) under your defense score of 14!! – Day 64, Target missed!! 8 (4+4), You have no choice to deal with it hand to hand now!! – Day 64, You rolled a 21 (5+16), which beats the attack score (13) of the Grey Slime. The creature is defeated!! You gain 1 experience points!! – Day 64, Target missed!! 6 (2+4), You have no choice to deal with it hand to hand now!! – Day 60, You rolled a 31 (15+16), which beats the attack score (20) of the Doppelganger. The creature is defeated!! You gain 1 experience points!! – Day 60, FUMBLE!! (You rolled a 1 on the d20). The move you just attempted made you look incredibly silly. Beside a nice dent in your pride, nothing else happened. – Day 59, The moon is dying in the night sky, slowly taking the magic substance of the realm with her. Arcane users now have a malus of -2 for casting spells. – Day 58, A drought is killing all of the crops in the kingdom and likely to last for the next 7 days, farms will not hire during these harsh times. – Day 57, Target hit!! 18 (14+4) You shot that Skeleton dead!! You gain 1 experience points. – Day 56, You enter the workshop. – Day 55, You rolled 18 (14+4)! You successfully crafted a Mithril sword!! – Day 55, You enter the workshop. – Day 54, Target hit!! 16 (13+3) You shot that Rust Monster dead!! You gain 1 experience points. – Day 54, The village folks overheard that you are a criminal and nobody whishes to speak to you! – Day 53, You rolled a 12 (3+9), which beats the attack score (12) of the Zombie. The creature is defeated!! You gain 1 experience points!! – Day 53, Target missed!! 9 (6+3), You have no choice to deal with it hand to hand now!! – Day 53, You rolled a 17 (8+9), which beats the attack score (15) of the Harpy. The creature is defeated!! You gain 1 experience points!! – Day 53, You missed by rolling 11(2+9), which is lower than the attack score (15) of the Harpy. But luckily, you blocked the counter attack by a saving throw (9) under your defense score of 13!! – Day 53, Target missed!! 7 (4+3), You have no choice to deal with it hand to hand now!! – Day 50, You rolled a 20 (11+9), which beats the attack score (19) of the Bulette. The creature is defeated!! You gain 2 experience points!! – Day 50, You rolled a critical (17), delivering a crushing blow to the Bulette but the creature is still alive!! – Day 50, You missed by rolling 17(8+9), which is lower than the attack score (19) of the Bulette. You also missed your saving throw (14) which is over your defense score of13!! You lose 1 hit point. – Day 50, Target missed!! 5 (2+3), You have no choice to deal with it hand to hand now!! – Day 49, The moon is dying in the night sky, slowly taking the magic substance of the realm with her. Arcane users now have a malus of -1 for casting spells. – Day 47, Target hit!! 16 (13+3) You shot that Bugbear dead!! You gain 1 experience points. – Day 43, You rolled a critical (17), slicing that Vampire in half. The creature is defeated!! You gain 2 experience points!! – Day 43, You missed by rolling 12(3+9), which is lower than the attack score (21) of the Vampire. You also missed your saving throw (18) which is over your defense score of13!! You lose 1 hit point. – Day 43, Target missed!! 14 (11+3), You have no choice to deal with it hand to hand now!! – Day 42, You enter the dwarven fortress. – Day 39, You rolled a 18 (11+7), which beats the attack score (15) of the Troll. The creature is defeated!! You gain 2 experience points!! – Day 39, Critical hit!! (19), but the Troll is still standing!! You have no choice to deal with it hand to hand now!! – Day 38, You walk across the sturdy gates of the castle. – Day 38, You rolled a 22 (15+7), which beats the attack score (13) of the Carrion Crawler. The creature is defeated!! You gain 1 experience points!! – Day 38, Target missed!! 14 (11+3), You have no choice to deal with it hand to hand now!! – Day 36, Target hit!! 18 (16+2) You shot that Grey Slime dead!! You gain 1 experience points. – Day 35, Target hit!! 17 (15+2) You shot that Wight dead!! You gain 1 experience points. – Day 33, You sold your Jester Hat for 7 gold pieces. – Day 33, You sold your Scroll of Lightning Bolt for 68 gold pieces. – Day 33, You sold your Tome of Magic for 90 gold pieces. – Day 32, You rolled a 22 (16+6), which beats the attack score (15) of the Harpy. The creature is defeated!! You gain 1 experience points!! – Day 32, You missed by rolling 8(2+6), which is lower than the attack score (15) of the Harpy. But luckily, you blocked the counter attack by a saving throw (2) under your defense score of 5!! – Day 32, Target missed!! 5 (3+2), You have no choice to deal with it hand to hand now!! – Day 30, The merchant guild is exporting a lot of goods. Expect lower prices. – Day 29, This delicious food made you regain one hit point!! – Day 29, Although delicious, this food did not improve your health. – Day 29, You rolled a 20 (14+6), which beats the attack score (20) of the Mind Flayer. The creature is defeated!! You gain 2 experience points!! – Day 29, You missed by rolling 19(13+6), which is lower than the attack score (20) of the Mind Flayer. You also missed your saving throw (10) which is over your defense score of5!! You lose 1 hit point. – Day 29, You rolled a 22 (16+6), which beats the attack score (20) of the Mind Flayer. The creature is still alive!! – Day 29, You missed by rolling 8(2+6), which is lower than the attack score (20) of the Mind Flayer. You also missed your saving throw (6) which is over your defense score of5!! You lose 1 hit point. – Day 29, You missed by rolling 12(6+6), which is lower than the attack score (20) of the Mind Flayer. You also missed your saving throw (17) which is over your defense score of5!! You lose 1 hit point. – Day 29, The peasant has fled!! – Day 29, You missed by rolling 16(10+6), which is lower than the attack score (20) of the Mind Flayer. You also missed your saving throw (12) which is over your defense score of5!! You lose 1 hit point. – Day 29, Target hit!! 15 (13+2), but the Mind Flayer is still standing!! You have no choice to deal with it hand to hand now!! – Day 27, You rolled a critical (18) with that bow landing an arrow straight between the eyes of the Basilisk!! You gain 1 experience points. – Day 24, You found a stash hidden within the ashes of the ruins!! – Day 24, Your flee score of 19(19+0) was over 10. You managed to escape the Beholder!! – Day 24, Target missed!! 7 (6+1), You have no choice to deal with it hand to hand now!! – Day 22, You are not a frog anymore..
– Day 20, Monsters are getting slain in every corner of the realm. Expect fewer encounters. – Day 20, Your flee score of 14(14+0) was over 10. You managed to escape the Basilisk!! – Day 13, You go around the cliff. This detour took you 6 days. – Day 12, You rolled a 17 (17+0), which beats the attack score (17) of the Hag. The creature is defeated!! You gain 2 experience points!! – Day 12, You missed by rolling 12(6+6), which is lower than the attack score (17) of the Hag. You also missed your saving throw (10) which is over your defense score of5!! You lose 1 hit point. – Day 12, You sold your Wizard Hat for 30 gold pieces. – Day 11, You rolled a 25 (19+6), which beats the attack score (16) of the Gargoyle. The creature is defeated!! You gain 1 experience points!! – Day 9, You are carefully reading the map. – Day 3, You just picked a trapped chest.. and it hurts. – Day 2, You still have no idea if this chest is trapped or not. – Day 2, You rolled a 23 (19+4), which beats the attack score (13) of the Giant Wolf. The creature is defeated!! You gain 1 experience points!! – Day 2, You rolled a 21 (17+4), which beats the attack score (13) of the Giant Wolf. The creature is still alive!! not that often.?.?. ?… You got to be kidding! Not even I killed 2 Large Dragons in a single game and that is about the best set of fighting items one can get for a fighter class character aside from Excalibur and some other minor debatable stuff. That was one incredible lucky adventure as if the stakes rose same as your levels. Usually encounters are to random and you can get chased by 3 LRGs at lvl1 and then if you actually come as far to such an killer character only mall fry show up till the end. Thanks a lot for posting that. Was very lonesome in this forum for a while. – Day 10, You ready your weapons and wave at this flying mass of anger and destruction. 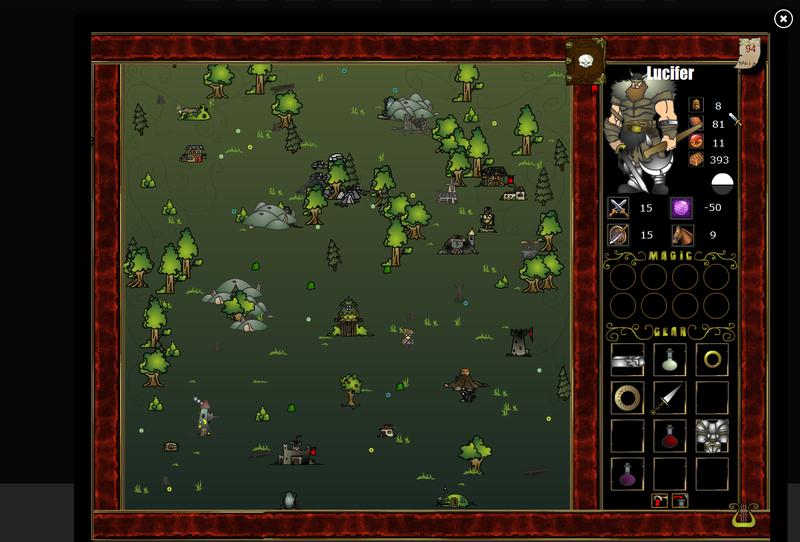 – Day 7, You rolled a 15 (15+0), which beats the attack score (10) of the Kobold. The creature is defeated!! You gain 1 experience points!! – Day 7, The King has appointed a new Magistrate and declared a realm wide amnesty to those who come to the castle in 2 days and confess their crimes. – Day 3, You rolled a critical (20), slicing that Goblin in half. The creature is defeated!! You gain 1 experience points!! – Day 3, The King has appointed a new Magistrate and declared a realm wide amnesty to those who come to the castle in 6 days and confess their crimes. – Day 2, Your flee score of 16(7+9) was over 10. You managed to escape the Beholder!! – Day 1, You walk across the sturdy gates of the castle. – Day 0, You enter the hunting ground.